We must take the current when it serves. 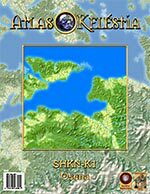 Keléstia Productions are pleased to announce the publication of Atlas Keléstia #42. This issue describes map square K1 (Ósena) on the Shôrkýnè regional map, in northernmost Hârbáal. The square is a mix of land and sea and includes all or parts of five thranáals in the Hârbáaler kingdoms of Gávrios and Elgósia. The Islands of Elgósia are separated from the mainland by the heavily trafficked waters of Elgós Pass, while Sútel Pass to the north divides Hârbáal from the Ivínian realm of Lókemheim.